Working on it! | Los Tabicones….Ahora en Chiapas! My how the months go by! I realize I placed a fairly brief description of my work on an earlier blog post; now after several months working in Chiapas I’d like to give readers more insight to my assignment with INESIN, and few goings-on here. There are a few pics as well to help show what I’m talking about (hey a picture, or several, is worth at least half my description!). As a service worker with MCC, I am “on loan” to INESIN, a local peace-building organization that works with community groups of various Christian confessions to encourage mutual respect, tolerance and even collective social action for the sake of God’s kingdom, that being humanity, and all the rest of creation. One part of INESIN’s work is community development, and we are currently involved in a family garden project in 7 communities. 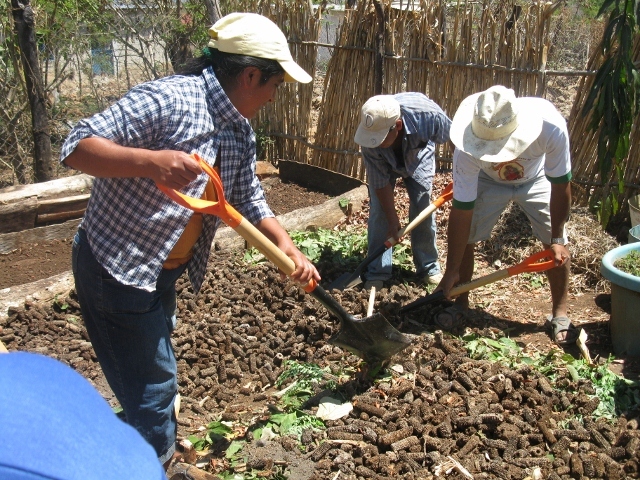 Each community group has about 15-20 families involved, and while some groups are new to the idea of working together to create a change they desire, other groups with more experience are moving in many exciting manners and directions as they build their capacity. 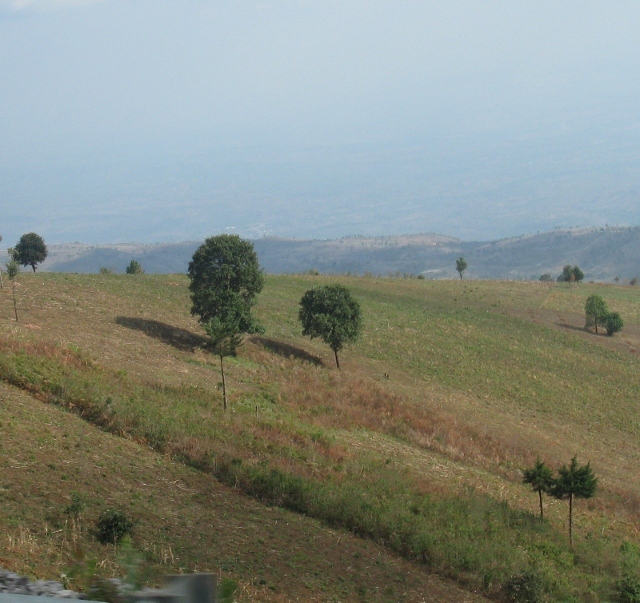 One community has me quite excited because after some discussion/presentation they decided to pursue a community-scale reforestation project, which we will help facilitate. Certainly, similar to my work in Canada, it is a deep joy to be part of a movement that helps raise the individual and collective capacity of those whose potential has been previously limited due to social custom, stereotypes, and at times a lack of knowledge or resources. 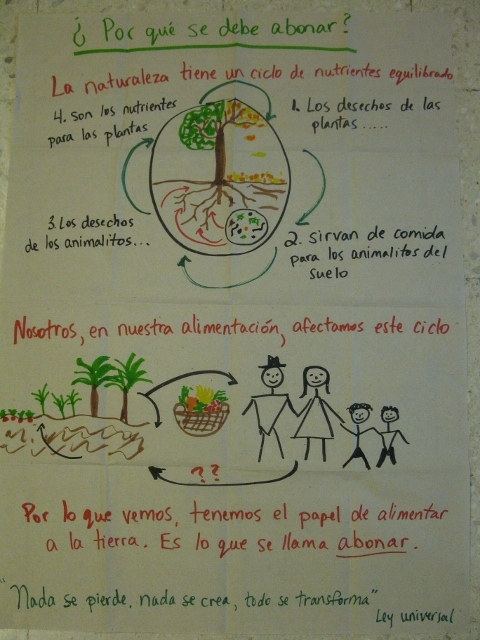 I am fortunate in that INESIN values this type of formation in its employees too…..this friday I am taking a trip to Yucatan state to take part in two courses offered by a unique “school” (Universidad de La Tierra) for the campesino (a campesino is a small farmer who must rent land, and often must work elsewhere during the dry season – this describes a large majority of rural families in Mexico). Hopefully I’m prepared for hot weather! 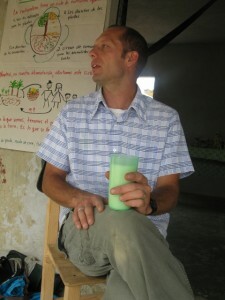 me, drinking sweet rice milk, and talking compost! we typically bring small packets of seeds with us when visiting groups – veteran groups buy the seeds at a reduced price, while we gift the seed packets to new groups to get started. In one community, after the frenzy of buying/discussing garden plans with fellow members, one elderly woman dropped a pack of onion seed, and some of the seeds spilled on the floor of the church. Most intentionally this woman (and I followed her lead) went to hands and knees to pick up every precious seed…. (was it that 3 pesos needs to be stretched as far as it can go, or perhaps she simply has a deep reverance for the sustenance that comes from every small seed?). 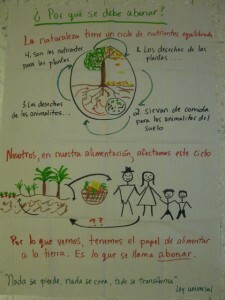 Chiapas is greatly blessed with trees….of so many sorts….I have a lot of botanical memory work on my plate! One thing I’ve noted is that all over the campo you will see trees throughout their fields – at least in fields farmed by campesinos – and the trees are typically well-pruned (especially the pines). No, this is not the rigidity of landscaping in the suburbs…its the reality of needing wood for cooking (leña is the word used for this type of use for small wood). 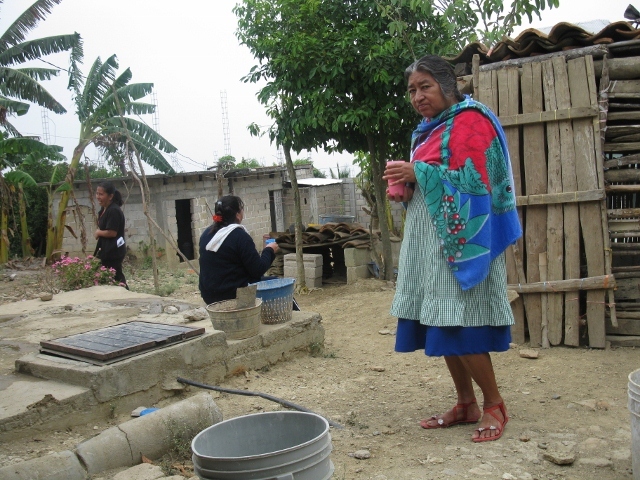 I would venture to say that nearly every household in rural Chiapas uses leña to cook their beans and tortillas. What impresses me is the conservation ethic that is practiced, not pruning too much, and certainly not cutting down the tree, as that would spell the end of their continued wood source. In one community, which was just established in the 1990’s, some folks moved here for two reasons, access to land (to rent from the ejido, or municipality), and available leña. While Chiapas is not nearly as dry as other Mexican states, there are towns and obviously people who struggle to access potable and washing water during the hottest and driest time of the year (March-April). As I carry water in 20 L pails a distance of 30 meters from INESIN’s water tank (very rare that San Cristobal would have shortage of non-potable water) to our garden in the back, I amreminded of the much more amplified struggle that many families have in making their ends meet on a daily basis, just in terms of water, during these difficult months. 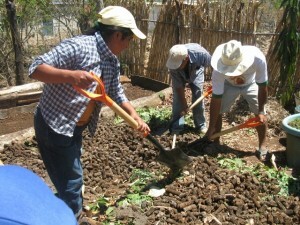 Their committment to maintaining a garden in order to achieve greater food security certainly comes with the price of hard work and patience. 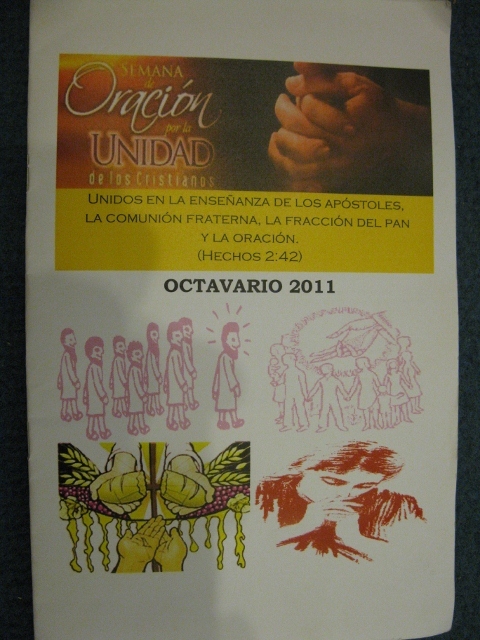 Lastly, I want to describe the picture below, which is a photo of a poster design for the Semana de Oracion por La Unidad de los Cristianos (Week of Prayer for Christian Unity), which is put on by various churches in San Cristobal, and in which INESIN plays a lead role. 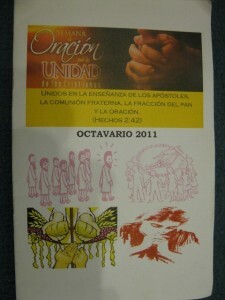 The context of Chiapas, with its past and current conflicts in which Christian confession has been intertwined with political and land issues, means that for churches from various confessions to identify with one another, to work with each other in claiming their fraternity, an important step has been accomplished. The focus of the joint services, the celebrations, are the shared foundations of all Christian confessions – the teaching of the apostles, the brotherhood/sisterhood of all believers, the breaking of bread (Lord’s supper), and a commitment to prayer. These we hold in common, and through these foundations God’s kingdom will continue to be realized, perhaps particularly in areas already “evangelized” (yes I’ll leave that as a bit of a hanging point for you to consider…). A highlight of the series of events is a friendly priests vs. pastors game of futbol! One Response to Working on it! Hey guys, I was just catching up on your life and wanted to let you know we still think about you from time to time! Sounds like things are going well! I’m so glad!